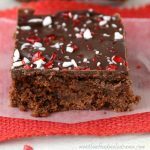 Easy Chocolate Peppermint Fudge is a velvety smooth no-bake holiday treat that takes just a few minutes to make. Everyone loves it! Even though I love baking during the holidays, I like to make a few easy no-bake treats, too. It’s all about balance, right?! The kids usually make a batch of festive chocolate dipped Christmas pretzels to share with their friends, and I like to make some bourbon balls for the adults. But today, we’re talking about fudge. 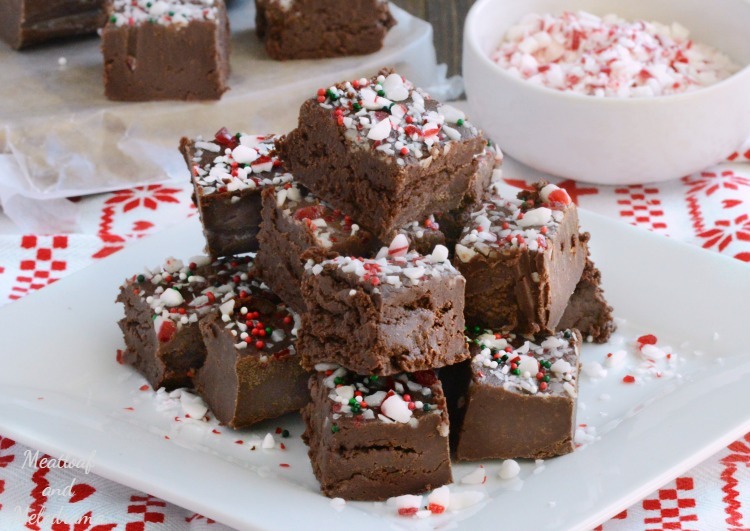 I think everyone has a favorite recipe for fudge that they make for Christmas. Actually, when I was was growing up, my mom’s neighbor used to always send over a plate of Fantasy Fudge. Anyone remember that? It was super rich, but way too sweet for me, and that’s definitely saying something, because I have a huge sweet tooth! 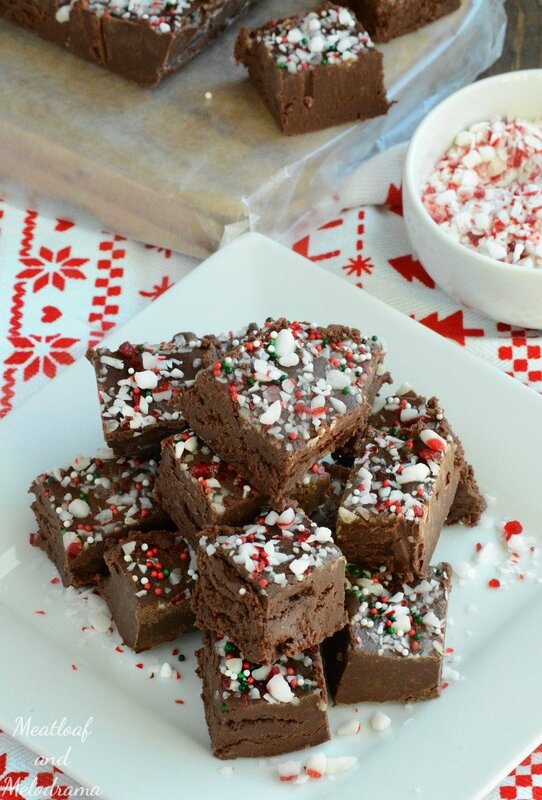 So I was never a big fan of fudge until I started making this peppermint version. It’s sweet, but it’s not too sweet — the peppermint definitely balances it out. And of course, you can’t go wrong with the classic chocolate peppermint combo! This fudge recipe is super easy, and it takes about a minute in the microwave — seriously. 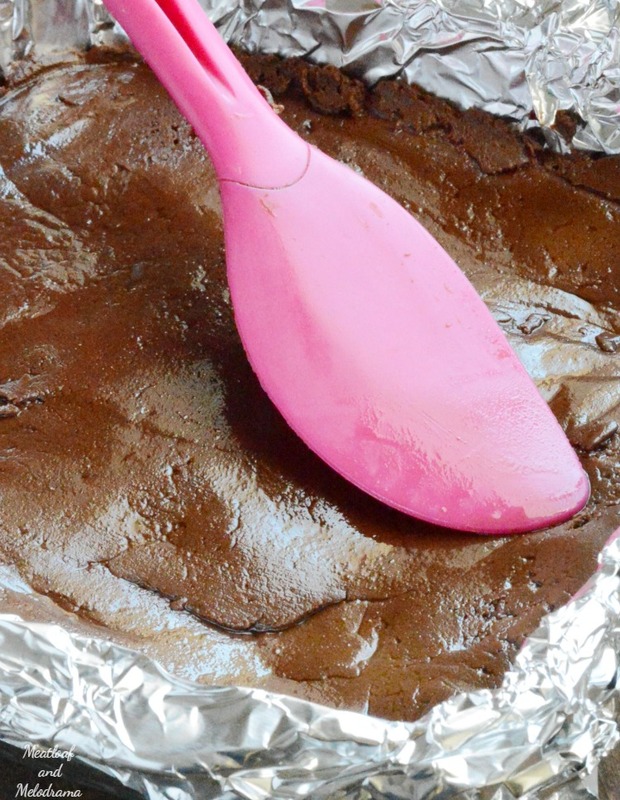 You just mix the ingredients together, melt the chocolate and pour the fudge into a foil-lined pan. And friends, please don’t skip the foil — it makes clean-up a breeze, and you need this during the holidays! 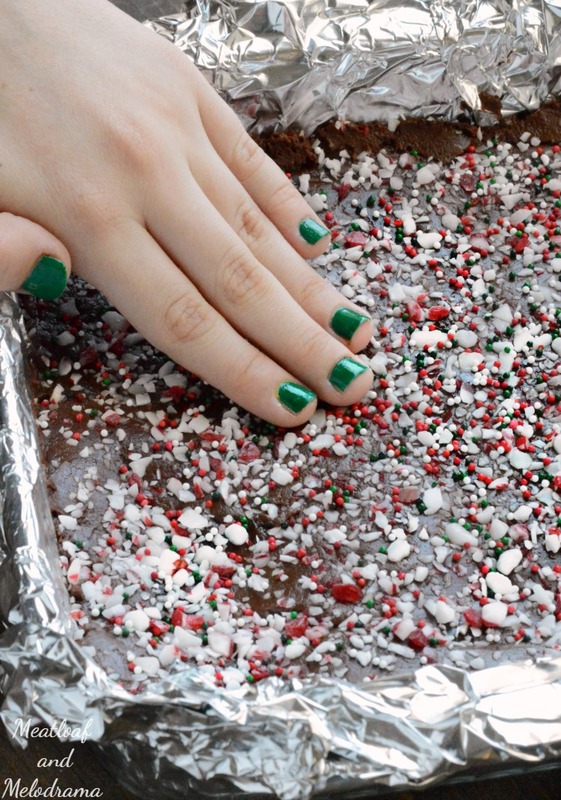 Next, you smooth the mixture out and top it with crushed peppermint candies. You can crush some candy canes or look for crushed peppermint candy in the store. I also added some red and green candy sprinkles, just for a little bit of extra color. Pop the pan into the fridge for about an hour, and the fudge is done. Just peel off the foil, and cut it into small pieces. Mine were about an inch, and I got about 40 pieces from this recipe. I say about, because we sampled a few pieces before we remembered to count them! Seriously though, isn’t this chocolate peppermint fudge gorgeous? We thought so, but that didn’t stop us from eating it. 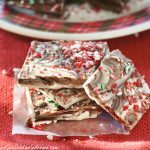 Peppermint + chocolate = heaven! This looks amazing! I completely agree with you, Kelly — one of my favorite combos! This looks so incredible!!! Wow! Thanks, Jocelyn! We love how it turned out! I just love easy fudge like this, and this is the best flavor combo! Wow! That is easy and I love chocolate and peppermint together. Thanks! 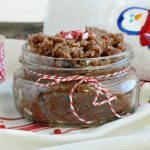 I agree…everyone needs a few no bake recipes during the holidays! This fudge looks fantastic! I love the addition of peppermint….definitely perfect for the holidays! 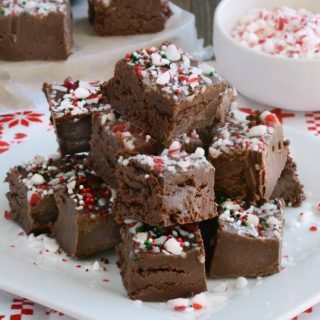 This fudge recipe sounds delicious, Dee; but maybe a bit too easy, as in making it too easy to make too often and eating too much….lol! Sounds like a great choice to make for neighbor gifts. Thanks for sharing. The perfect recipe for the holidays. Nothing better than fudge. What a delightful Fudge recipe that we will really enjoy! We really appreciate you sharing with us at Full Plate Thursday and hope you are having a great day! Hi Jessica! I usually keep it in an airtight container lined with wax paper and store it in the fridge, since our house is warm. It’s usually gone within a week, so I can’t say exactly how long it will keep, but it should be fine for at least 2 to 3 weeks. Can you leave out the peppermint extract and peppermint pieces and get a regular chocolate fudge?